Use 1-2 teaspoons for an 8-10 inch apple pie. Add to muffins, puddings, fruit crisps, cakes, and cobblers for that wonderful, warm apple taste. Add to pancake and waffle batter. Sprinkle on French toast and hot cereal. Delicious when added to crumb topping for coffee cake. Stir into applesauce. Sprinkle over sliced refrigerated sugar cookie dough before baking. 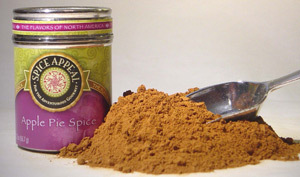 Contains Chinese cassia, Korintje cinnamon, mace, cloves, and nutmeg.